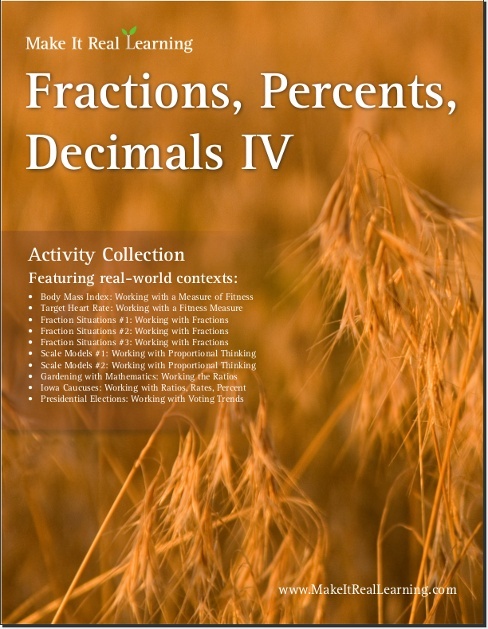 The Make It Real Learning Fractions, Percents, and Decimals IV workbook focuses on real-world situations that may be effectively analyzed using arithmetic concepts such as fractions, percents, and decimals. This book suits best grades 4-7. From figuring out body mass index to ratios in fertilizers and voter turnout rates, learners get to use basic math skills in meaningful ways. Each activity integrates real world information, companies, and issues (e.g. M&Ms, fitness & target heart rates, Seattle Space Needle and a scale model of it, presidential elections), not just "realistic" data. Working with a Measure of Fitness Calculating BMI using the formula, given the height in inches and weight in pounds. Working with a Fitness Measure Calculating target heart reate for moderate or vigorous exercise based on a person's age. Comparing given heart rate to the target heart rate. Working with Fractions Adding and subtracting unlike fractions. Changing a fraction into a percent. Working with Fractions Multiplying and dividing fractions and mixed numbers. Working with Fractions Problem solving: using all four operations with fractions. Working with Proportional Thinking Calculating dimensions in reality or in the model using the given scale. Figuring out the scale ratio. 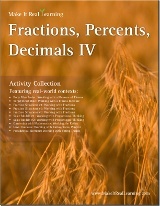 Working with Ratios Calculating amounts of minerals in fertilizers based on the NPK ratio. Problem solving using the fertilizer analysis.